Tags: Bright Red, Evening Dresses, Royal Blue, Shalwar, Shirt. Top: Silky Royal blue shirt. Embellishments made on neckline and sleeves. 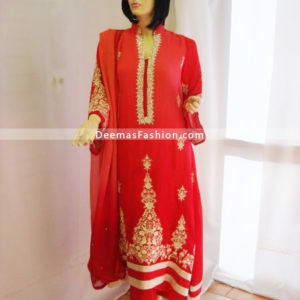 Beautiful red 1.5 inches embroidered border on neck and sleeve. Small motifs sprayed all over front. Shalwar/Trousers: Plain royal blue shalwar.